The aim of our study was to study the clinical profile of type 2 diabetes mellitus patients admitted with the diagnosis of acute kidney injury (AKI) due to bilateral acute non-obstructive pyelonephritis. The bilateral involvement was identified on various imaging modalities (ultrasound, computed tomography, nuclear scintigrapy). All the patients had AKI. Those with severe AKI underwent hemodialysis. The factors associated with the severity of illness were identified. Twenty-five patients of type 2 diabetes mellitus admitted with the diagnosis of AKI due to bilateral acute non-obstructive pyelonephritis were identified. On ultrasound, bilateral involvement was found in 12 patients and in 17 patients on computed tomography and eight patients on nuclear scintigraphy. Fourteen of them needed dialysis support. Bilateral acute pyelonephritis needs to be considered while evaluating the AKI in type 2 diabetes mellitus patients. Acute pyelonephritis in patients with diabetes mellitus is severe and may present as septicemia with acute kidney injury (AKI). AKI in acute pyelonephritis can occur either due to sepsis or due to direct infection of the renal parenchyma bilaterally. With this background, we studied a group of patients of type 2 diabetes mellitus presenting with bilateral non-obstructive acute pyelonephritis and AKI. The aim was to study the clinical profile of bilateral non-obstructive acute pyelonephritis with AKI in patients of diabetes mellitus. For AKI, all the patients were given hemodialysis (intermittent mode, polysulfone membrane, hollow fiber dialyser) through internal jugular access. The number of sessions given, the number of days of dialysis support, the discharge serum creatinine and the duration of hospitalization were noted in all the patients. Those patients with unilateral acute pyelonephritis, obstructive uropathy, associated hypotension and history of usage of nephrotoxic drugs were excluded from the study. The clinical and laboratory data were analyzed using percentages, frequency tables (one-way tables), cross tabulations (two-way tables), Student's t-test and Chi-square test. All these tests were performed using SPSS 17.0 version and interpretations were carried out as per the P-value (P <0.05 was considered significant). A total of 25 patients were found to have bilateral non-obstructive acute pyelonephritis with AKI. The bilaterality of acute pyelonephritis was diagnosed with radiological investigations (CT/NS) carried out at our institute. The severity of acute pyelonephritis was graded as mentioned above. Among the bilateral grading, the more severe grade was considered. The mean age of the group was 58 ± 9.3 years. The male to female ratio was 3:2. Clinically, fever was present in all patients. Oliguria and dysuria were present in 16 (64%) and ten (40%) patients, respectively. All of them had normal blood pressures at admission. Mean hemoglobin was 10.4 ±1.2 g/dL, total leukocyte count was 18,956 ± 9295 cells/mm 3 and platelet count was 1.87 ± 1.11 lakhs/mm 3 . Leukocytosis and thrombocytopenia were found in 17 patients (68%) and nine patients (36%), respectively. All the patients had pyuria. Microscopic hematuria was present in two patients (8%). The mean blood urea was 157. ± 67.8 mg/dL and the mean serum creatinine was 5.43 ± 2.6 mg/dL. Mean blood sugar was 211 ± 110 mg/L. There are no data available about mean HbAlC. Urine culture grew Escherichia coli (E. Coli) in 11 (44%) and Staphylococcus aureus (S. aureus) in four (16%) patients, and it was sterile (40%) in the remaining patients. Blood culture grew E. coli in two patients. All the patients were treated with Cefoperazone or Piperacillin or Linezolid antibiotics based on the sensitivity report. Those with culture-negative acute pyelonephritis were treated empirically with Cefoperazone + sulbactam or Piperacillin + tazobactum. The mean duration of antibiotics was 10 ± 2.3 days. Urine cultures of all the patients were negative for mycobacterium or fungal organisms. Ultrasound showed bilateral features in 12 patients only (44%). This was confirmed on CT in ten and on NS in two patients. Of the remaining 13 patients, seven showed bilateral features on CT and six patients showed bilateral features on NS. On computed tomography, grade 2 (severe APN) was present in 16 (64%) patients and one patient had grade 3 changes in the form of renal abscess of 4 cm in size [Figure 1]. Figure 1: Computed tomography showing acute pyelonephritis changes bilaterally (grade 2 on the right side and grade 3 on the left side). AKI of variable degree was noted in all the patients. Eight (32%) patients were in AKIN 1, three patients (12%) were in AKIN 2 and 14 patients (56%) were in AKIN 3. The mean number of hemodialysis sessions was 6 ± 3. The mean number of days of duration of hemodialysis was 10 ± 5.4 days. The mean discharge serum creatinine was 3.5 ±1.8 mg/dL and the mean duration of hospitalization was 11.2 ± 6.6 days. The factors that influenced the need for hemodialysis at discharge and a prolonged duration of hospitalization were found to be older age, male gender and presence of oliguria (P <0.05). During the 8-year period, 25 diabetic patients with bilateral non-obstructive acute pyelonephritis associated with kidney injury were identified. The mean age of the group was 58 ± 9.3 years. The male to female ratio was 3:2. Symptoms suggestive of acute pyelonephritis in the form of fever and pyuria were present in all the patients. None of them had bilateral renal angle tenderness. Despite the absence of clinical signs suggestive of bilaterality, the imaging studies showed the changes in both the kidneys. Polymorphonuclear leukocytosis was present in 17 (68%) patients. E. coli was the most common organism grown on urine culture. Two patients grew E. coli in blood culture. All the patients received appropriate antibiotics. S. aureus was grown in four patients. Despite our thorough effort, we could not find the source for S. aureus. All the patients had a variable degree of AKI. Fourteen patients were in AKIN 3, for whom hemodialysis support was given. At the time of discharge, eight of the 14 patients continued the need of hemodialysis support and the remaining six were independent. None of them came for regular follow-up. AKI may occur in acute pyelonephritis because of several mechanisms such as (1) presence of infection in both the kidneys, (2) cytokine-mediated injury due to sepsis from unilateral pyelonephritis and (3) hypotension or shock secondary to sepsis from unilateral acute pyelonephritis resulting in acute tubular necrosis. The factors predicting severe acute pyelonephritis were found to be old age, male gender, presence of diabetes and acute renal impairment. In our study, the severity of illness as assessed by the requirement of dialysis at discharge and the duration of hospital stay were significantly associated with old age, male gender and oliguria [Table 2]. Table 2: The factors influencing prolonged hospital stay and discharge creatinine. The purpose of this retrospective observational study is to make a deliberate effort to rule out bilateral pyelonephritis in every patient of acute pyelonephritis with AKI. As this is not a comparative study between diabetics and non-diabetics, it is not appropriate for us to say that it is common in diabetics. We did not find any risk factors predisposing for bilaterality. However, none of our patients had urinary tract obstruction or reflux, or renal stone disease. In fact, we wanted to stress that despite the absence of such predisposing factors, we reiterate to exclude bilaterality as it may be silent and goes undetected. It appears that this entity did not find adequate place in the literature. Often, when there is associated kidney injury with acute pyelonephritis, the possibilities of sepsis, nephrotoxic drug exposure and contrast-induced kidney injury need to be considered. In the absence of bilateral loin pain, which many a time is absent, the differential diagnosis of bilateral acute pyelonephritis is often overlooked. Hence, we made an attempt in our study to impress upon the readers regarding the need for an extra effort to look for bilateral involvement with the help of imaging modalities like ultrasound, CT and NS. The limitations in our study are: Small group of observational study and inadequate follow-up and number of the patients who had bilateral involvement of the total number of diabetic urinary tract infections. In conclusion, our study emphasizes to consider the entity of bilateral non-obstructive acute pyelonephritis in type 2 diabetes mellitus patients presenting with AKI. 1. Kawashima A, Sandler CM, Goldman SM. Imaging in acute renal infection. BJU Int 2000;86 Suppl 1:70-9. 2. Talner LB, Davidson AJ, Lebowitz RL, Palma L, Goldman SM. Acute Pyelonephritis. Can we agree on the terminology? Radiology 1994;192: 297-305. 3. Mehta RL, Kellum JA, Shah SV, et al. Acute kidney injury. Network: Report of an initiative to improve outcomes in acute kidney injury. Crit Care 2007; 11:R31. 4. Boswell WD Jr., Jadvar H, Palmer S. Diagnostic of kidney imaging. Brenner & Rector's THE KIDNEY. 8 th ed. In: Brenner BM, ed. Philadelphia: Saunders Elsevier;2008 p. 839-914. 5. Piccoli GB, Colla L, Burdese M, et al. Development of kidney scars after acute uncomplicated pyelonephritis relationship with clinical, laboratory and imaging data at diagnosis. World J Urol 2006;24:66-73. 6. Majd M, Nussbaum Blask AR, Markle BM, et al. Acute Pyelonephritis; Comparison Of Diagnosis with Tc -DMSA SPECT, Spiral CT, MR imaging and power Doppler US in an experimental pig model. Radiology 2001;218:101-8. 7. Lim SK, Ng FC. 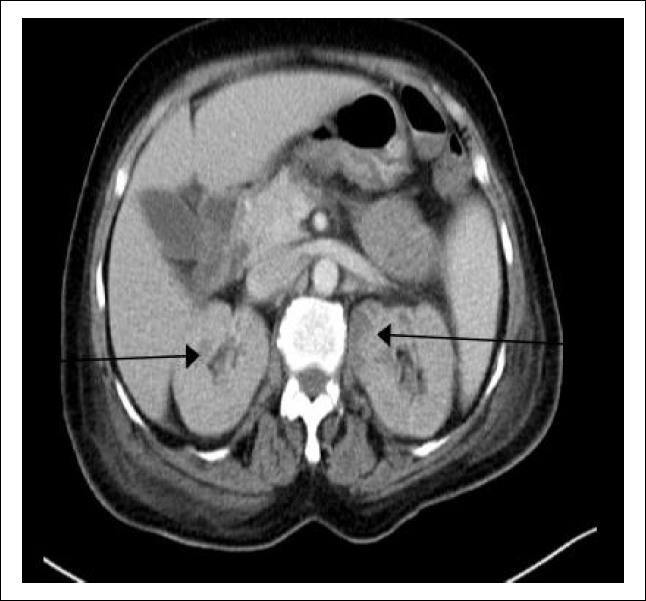 Acute pyelonephritis and renal abscesses in adults - Correlating clinical parameters with radiological (computer tomography) severity. Ann Acad Med Singapore 2011;40:407-13.